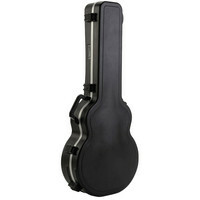 The SKB Universal Guitar Hardshell Case is designed to fit most common jumbo acoustic guitars and incorporates superior structural features that include a rubber-modified styrene shell. The interior EPS foam cradles the guitar securely and absorbs shock protecting from impact damage. Other features include a molded in bumper design to provide maximum protection for the valance and full-length neck support. The TSA accepted locks with SKBs trigger release latching system make this case perfect for any travelling musician wanting to protect their precious acoustic guitar. This entry was posted in SKB and tagged Guitar-and-Bass. Bookmark the permalink.